An astronomical conjunction has cropped up. Arpanet is back after a long interstellar hibernation and 30drecords.comes up with its particular vision of the abstract Elektro for the very first time. “Phases EP” takes the primal Warp’s heritage blending hypnotic melodies with rhythmically complex patterns. Arpanet, which keeps the exquisiteness of its previous works for Rephlex, among other labels, gazes into the black profoundness of its own and unique universe. 30drop’s two cuts, ostensibly touched by the Aphex Twin spirit, are a spellbinding exercise of style. “Phases EP” is experimental, atmospheric, rhythmic and, above all, flawless. 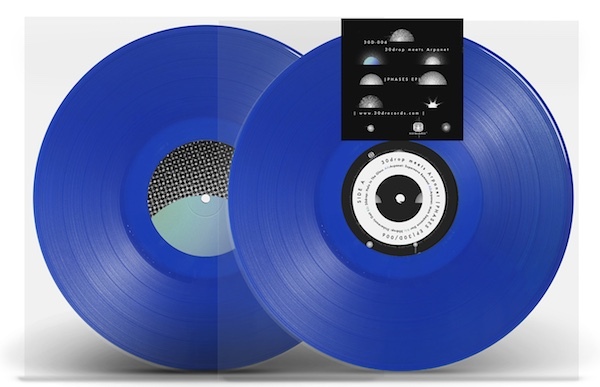 This enthralling EP is presented in electric blue vinyl. A special shape for a very special alliance. Release date: 25 June 2018. – Mental Resonance: “Awesome record guys. Thanks !